I don’t print all that much but it would be nice to have a printer that worked when you need it. Due to lack of use the ink cartridges always seemed to be clogged up when I needed to print something. This resulting in a lengthy cartridge cleaning cycle that never worked properly and wasted ink. A new set of cartridges cost almost as much as the printer so I thought it was time for a change. I reasoned that a laser printer wouldn’t ‘dry up’ if not used, as the toner is already a dry powder. 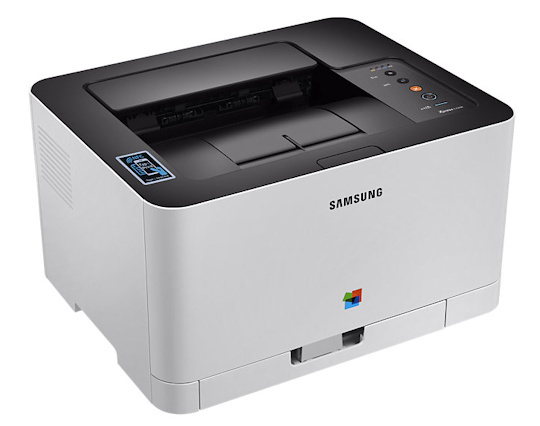 Laser printers tend to be a bit bigger than inkjets but a bit of research came up with the Samsung C430W Xpress, a small footprint colour laser printer. 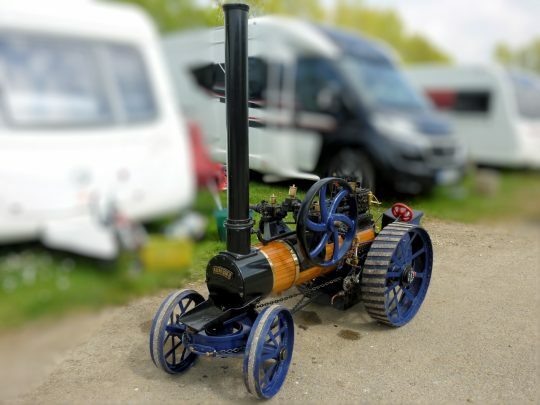 The printer was ordered on ‘Black Friday’, more by luck than planning, but was priced at £85.00 rather than the usual £129.00. It was also at the same time subject to a Samsung promotion of an extra set of toner cartridges to be claimed later. Also had an extra years warranty courtesy of John Lewis. Despite the best efforts of the courier the printer turned up eventually, the outer packaging was a bit battered but the box seemed to have staved off most of the results of being ‘in transit’ for 10 days! Unpacking was straightforward and there was plenty of styrafoam to protect the printer in it’s box. The printer was basically ready to go once all tape holding covers and trays in place had been removed. Even the toner cartridges were in place and ready to run without any preparation. First thoughts are that the plastic case seems a bit flimsy, everything bends and creaks when pressed. The paper tray seems very light duty, time will tell whether it is up to the job. The printer is quite heavy though so there must be a reasonable amount of metalwork holding it together somewhere under the flexi-covers. Big disappointment was that the paper tray sticks out the front when loaded with paper. This is not made clear in any of the sales blurb or even the specification. There are no pictures anywhere with the tray sticking out at the front, I think this is a bit remiss of Samsung not to mention this as it adds 90mm to the depth. The footprint with the tray in shipping mode is 380mm wide, 310mm deep, 210mm high. The depth in normal use mode is 400mm. The paper tray expands the first time you pull it out and clips into it’s new larger footprint. If you remove the paper, the tray does not shrink back to it’s original size without a bit of effort to find the clicky somwhat flimsy locking tab. If you only want to use A5 paper, it will work with the tray concertina’d in, which restores the advertised footprint. Once over that annoyance (I decided I could live with the ‘new’ footprint) I installed the drivers and set the printer up. There is a CD with the drivers but my PC doesn’t have a CD/DVD drive, fortunately the drivers are also downloadable from the Samsung support site. Not quite sure what happened with the driver installation but I seemed to end up with three printers. That was probably a combination of me not reading the instructions carefully, Windows 10 and the downloaded drivers. However I gave it a quick test on the usb cable which seemed to work OK and then deleted the printers in device manager and used the usb cable to set up for a wireless network setup. Everything now works fine with just the wireless network connection and just one printer showing in ‘Devices and Printers’. I can even print from my phone and tablet though I am not quite sure why I would want to. The printer seems to be reasonable value for money, especially if you can find it on offer somewhere. Print quality is good but don’t get it for your photos. Casing and paper tray seem a bit flimsy but there is plenty of weight inside. My only other criticism was the labels stuck all over the front, I really don’t need all the store display advertising permanently stuck to the front! At least make the labels easy peel, I had to spent 15 minutes with a bottle of foul smelling label remover to get everything off. A full set of toner cartridges will cost more than I paid for the printer. The colour cartridges are rated for 1000 pages and the black for 1500. I am hoping that with the spare set of cartridges from Samsung’s offer I shouldn’t need to buy any more before the printer wears out. With both the museum exhibits and the exhibition there was plenty to see. 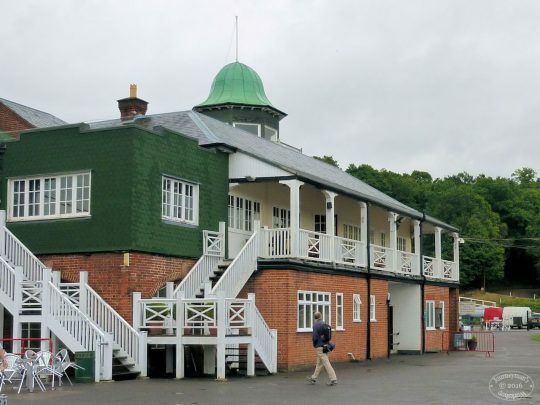 The competition and loan models together with the club stands were based in the museum whilst the trade stands were in a large marquee. On-site catering was good and there was plenty of seating both in the restaurant and close to the models. There was also plenty of outside seating available once it stopped raining and dried out. The traders area was well supported but some of the “usual” suppliers were noticeable by their absence. 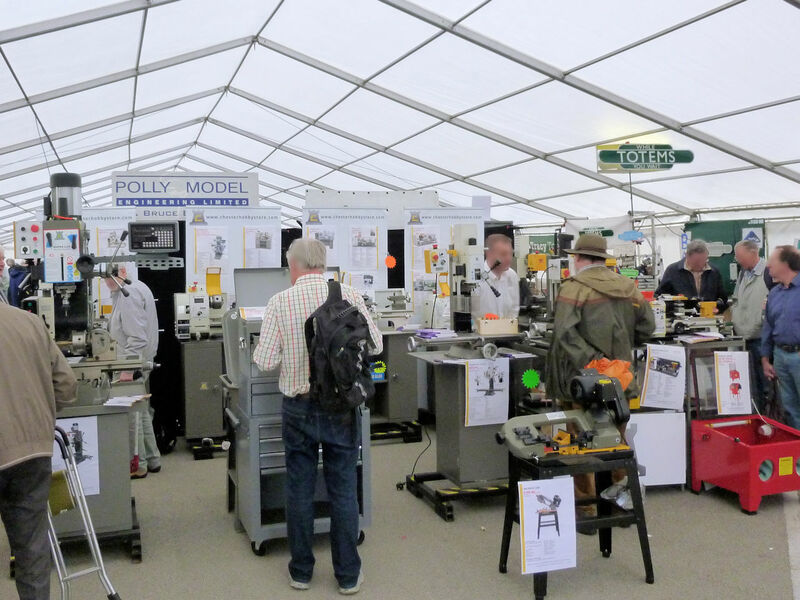 A view inside the marquee (2) showing Chester Tools stand, quite a bit smaller display than I have seen before. With the increase in on-line sales and increasing costs of attending a show I think this will become the norm for future exhibitions. I had a quick look round but my wallet stayed resolutely in my pocket. Off to the model displays which were based in and around the clubhouse (3), built around 1907 it houses the members billiards room, the clerk of the course office, and you could find similar buildings on most horse racing courses of the period. 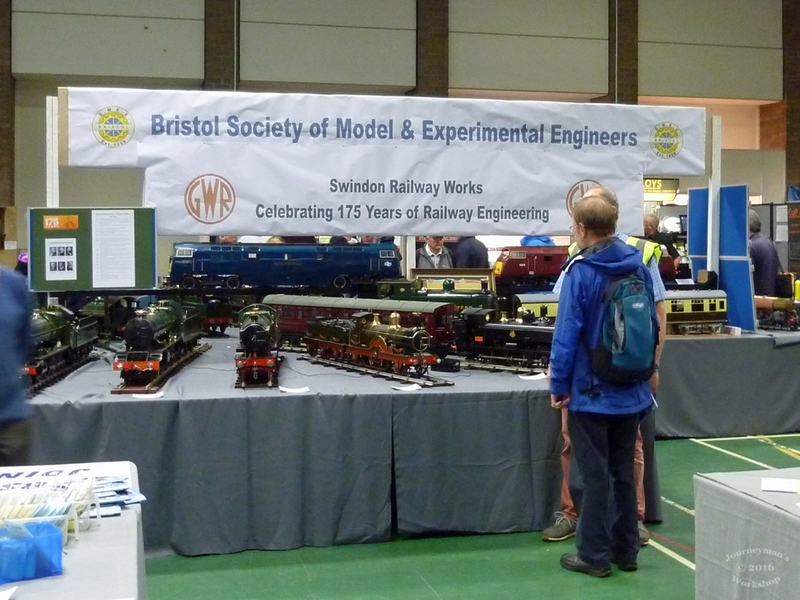 Braved Saturday′s somewhat inclement weather to drive the 110 miles to visit the Bristol Model Engineering & Model Making Exhibition. The exhibition, as in previous years, takes over most of the available space at the Thornbury Leisure Centre. 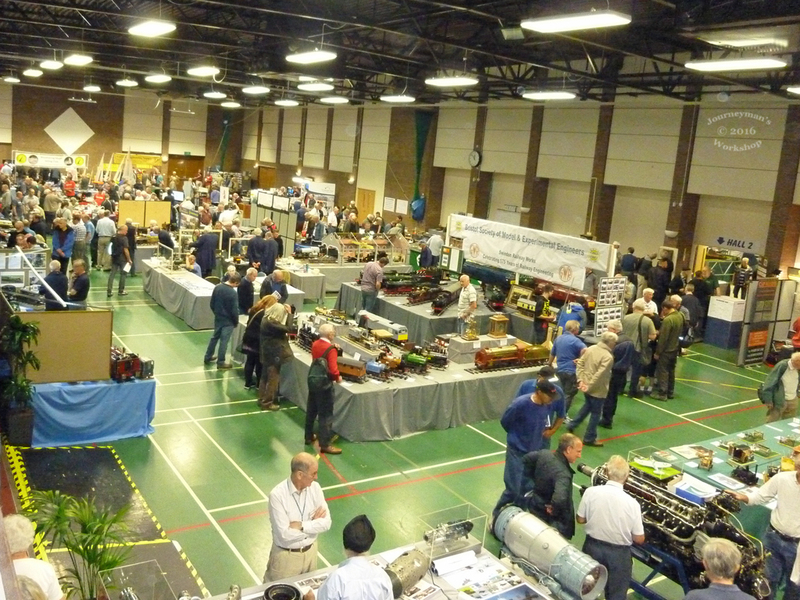 Slightly different layout this year as the Centre was using one of the smaller rooms but plenty of models for visitors to enjoy and enough traders to supply all those engineering necessities and lighten your wallet. By my reckoning about 40 trade stands, 50 club stands and some 40 private exhibitors helped fill the display stands. 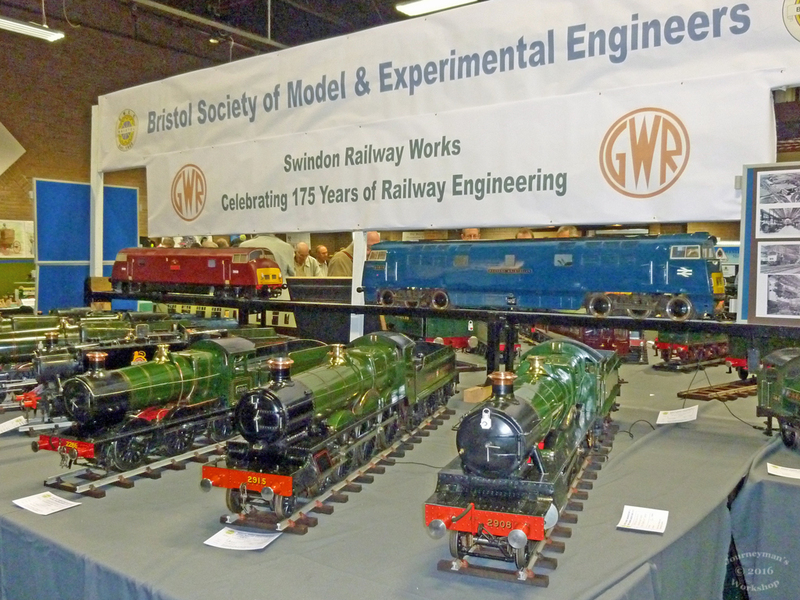 GWR Swindon works celebrates it′s 175th year and the BSMEE stand acknowledges this with a fine display of GWR locos. 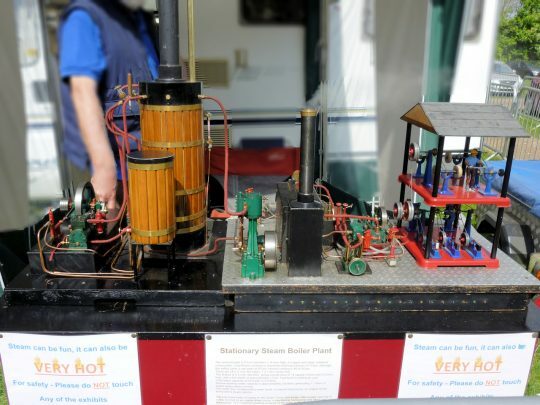 The Society also promoted a theme of “model making” for the show and this is reflected in the change of name for the event, which the observant will have noticed, I didn′t until I read the exhibition guide! Some of the GWR locos on display (1), two Saints nearest the camera 2908 and 2915 with 2286 a 0-6-0 Collet design tender loco on the left. Click On Photos For A Larger Image. 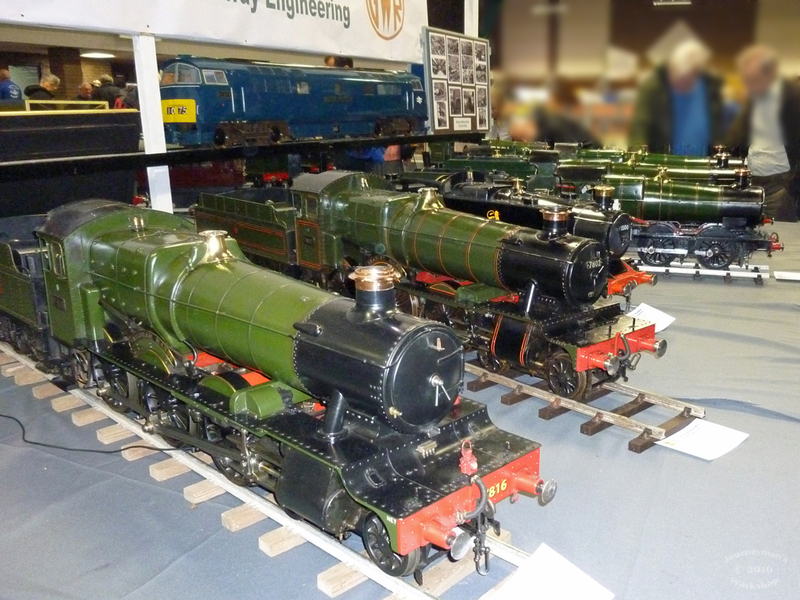 At the opposite end to the Saints are; (2) Frilsham Manor 7816 and Bradley Manor 7802. A general view of the BSMEE stand (3) and a view from the balcony (4) which shows how quiet it was, I think the weather and the Olympics conspired to keep potential visitors at home, apparently Friday was a lot busier. 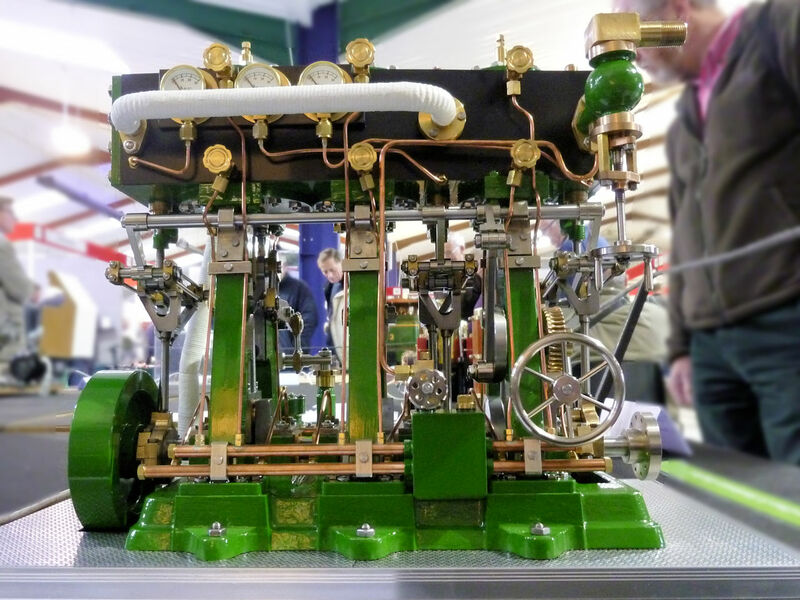 As last year I have selected just a few of the hundreds of exhibits on display. I recently spent an interesting few hours visiting the Magyar Vasúttörténeti Park. 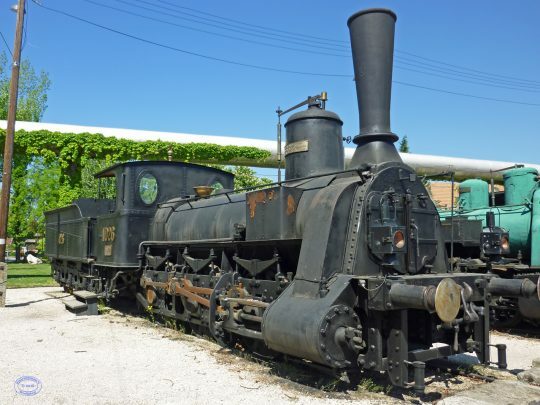 This is a large open air railway museum in Budapest, a bit away from the usual tourist hotspots but still quite easy to reach with a short walk from bus or tram stop. There is a direct railway link at weekends running from Nyugati Station. Opened in 2000 the museum covers some 7 hectares (17 acres) on the site of the former MÁV (Hungarian State Railways) Budapest North Depot. 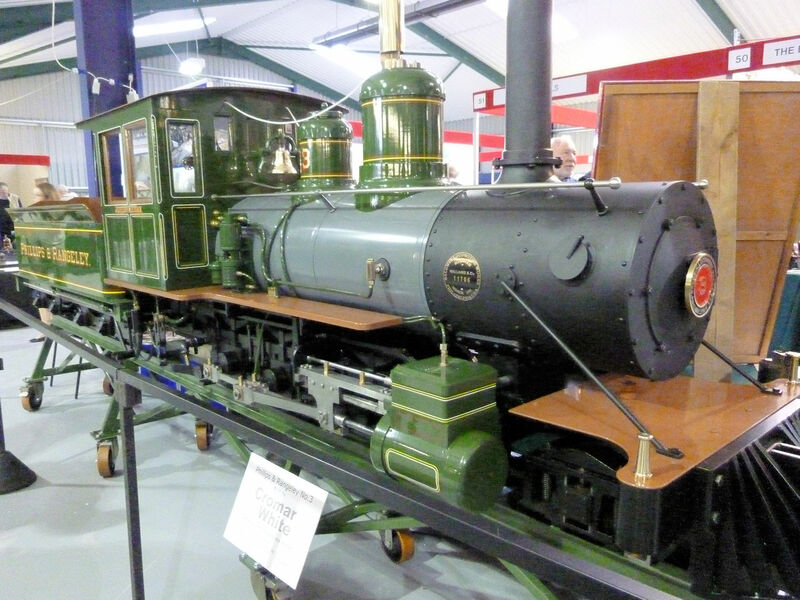 There are more than 50 locomotives in various states of preservation along with a huge selection of rolling stock. Some of the exhibits run at weekends and holidays and you can even get to drive one although I think you have to book in advance for this. Not everything is open every day and a weekend visit seems to be the best choice but it is popular locally and quite busy. The locomotives are without doubt the main attraction and for any European Railway Enthusiast a day will likely not be enough time! First up is MÁV 1026 (pictured above) a class 341 (341,012) freight locomotive build by Wöhlert Berlin in 1882, the information given for the loco shows the wheel arrangement as C-n2. 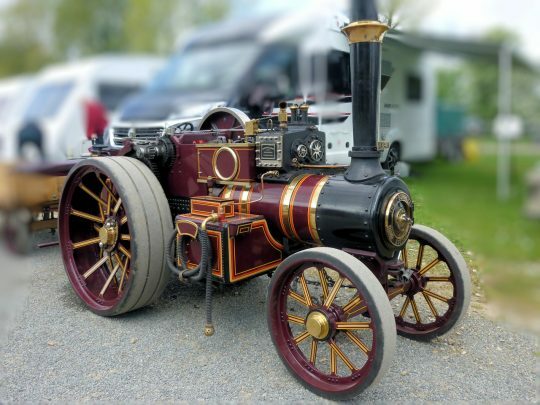 This had me a bit confused until a quick web search revealed that this is the European UIC class and apparently means it is an 0-6-0, 2 cylinder loco using saturated steam. 1026 spent a good deal of it’s working life (1959 to 1985) in a sugar factory in Sárvár. 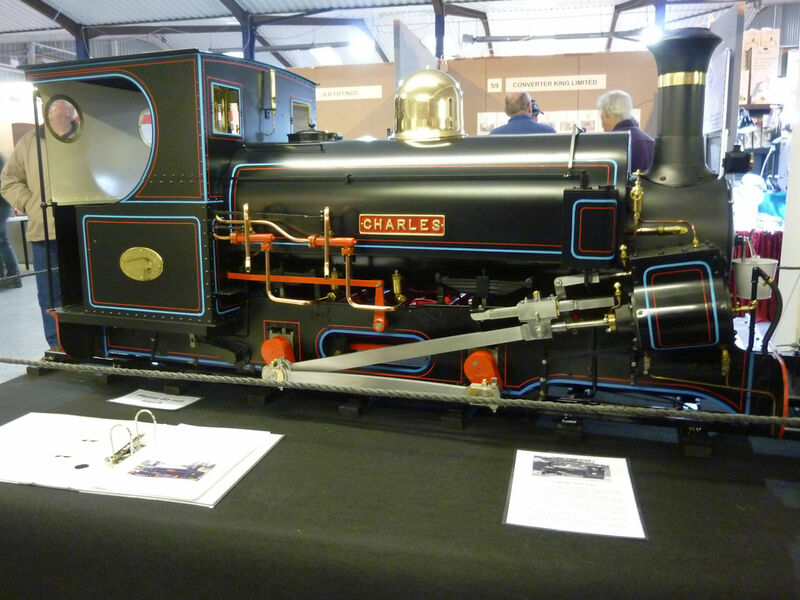 Like many locomotives the number and class has changed several times through it’s lifetime.